Hello! 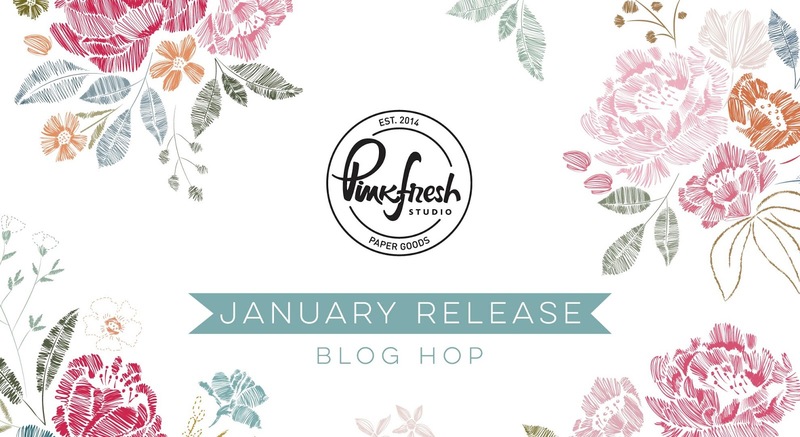 Welcome to the first Pinkfresh Studio stamp and die release (and blog hop!) of 2019! It's a good one, too--a really good one, so you will want to check out all the stops to see everything in action. As always, there are giveaways and Pinkfresh shop promotions to be had, and I'll have all the details at the end of this post. If you're here from Patricia Roebuck's blog, welcome! She's one of my favorite ladies in this crafty community so I know she had something awesome for you! I've used the Scripted Bold Sentiments 1 & 2 stamps on my projects today. It's always useful to have those sentiment staples in your stamp collection, and these are big with a modern graphic look to them, which I personally love! I paired them with some of the dies from the new release so you can see their versatility. My first card features the "Happy Birthday" message from the #2 set. You can never have too many birthday cards, right? So how about this one, with the big, bold sentiment stamped in a navy ink on a white card base? Off to the left side, with the Spring Floral die duo, I adhered the base, the more solid design of the two, which I cut from a 6x6 version of Indigo Hills 2 Glen paper. On top of it, I cut the partner piece, a more intricate floral design, from gold glitter cardstock. I took a few of the tiny petal-like negatives that fell from the top Spring Floral die and arranged them around my Happy Birthday sentiment like confetti. 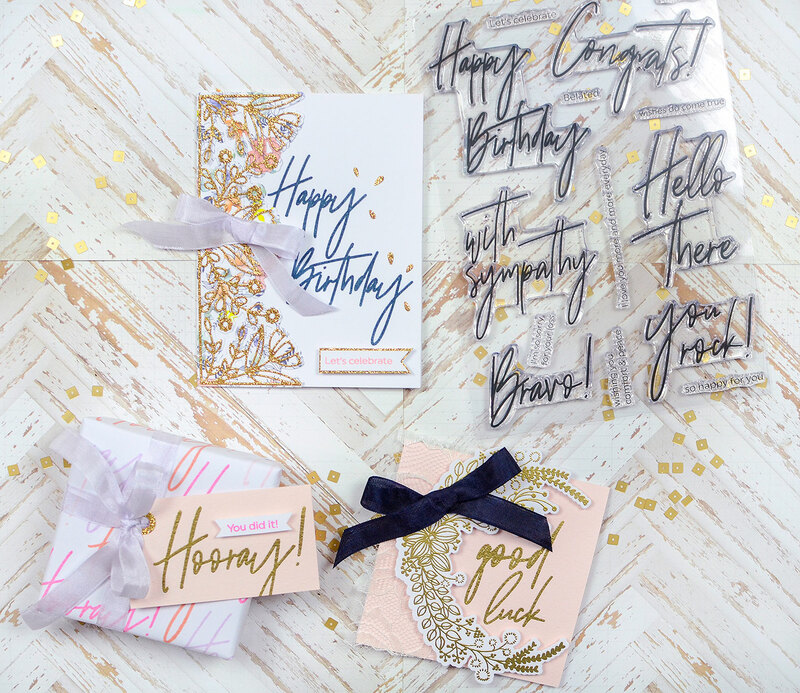 It should be an occasion to celebrate, after all, so a little confetti--and a little flag with the secondary "Let's Celebrate" order--make for a festive card. The final touch is a lavender ribbon bow, which brings in a little more texture and color. On the second card, I've chosen "good luck" as my sentiment, since it fits so nicely within the Heart and Soul floral die when that die is turned on its side. It makes a beautiful frame for the sentiment, which is stamped in VersaMark Watermark ink and embossed with fine gold powder, on a blush pink base. I stamped the floral frame in Watermark ink, also, and embossed it in gold on white cardstock. Before I adhered it in place, I placed a swatch of pretty lace under it and used 3-D foam dots to give it some lift off the card. Again here, a ribbon bow, this time in navy, adds a sophisticated splash of color to this canvas. You can do more than make cards with these phrases, too. I decorated this small gift box with it, and the size of these sentiments makes them terrific for large packages, as well. I stamped "Hooray!" on bright white 8 1/2" x 11" copy paper. I chose bubblegum pink, lavender, peach, and pale pink inks and stamped the word repeatedly, covering the paper. After I was done, I wrapped my 4" x 4" box with the custom wrap and I love how graphic and colorful it looks! I added some pale purple ribbon and made a simple 2" x 3 1/2" pink tag by embossing "Hooray!" in gold on it. Above that, I adhered a little white banner with a pink-stamped "You did it!" message. It's such a simple little gift, and much different than the floral pieces I made with the cards. That's the beauty of these stamp sets--they can go from feminine to elegant to graphic and fun, and everything in between! The giveaways! Pinkfresh is giving away the full release set on both its blog AND its Instagram feed, so be sure to check out both of those. 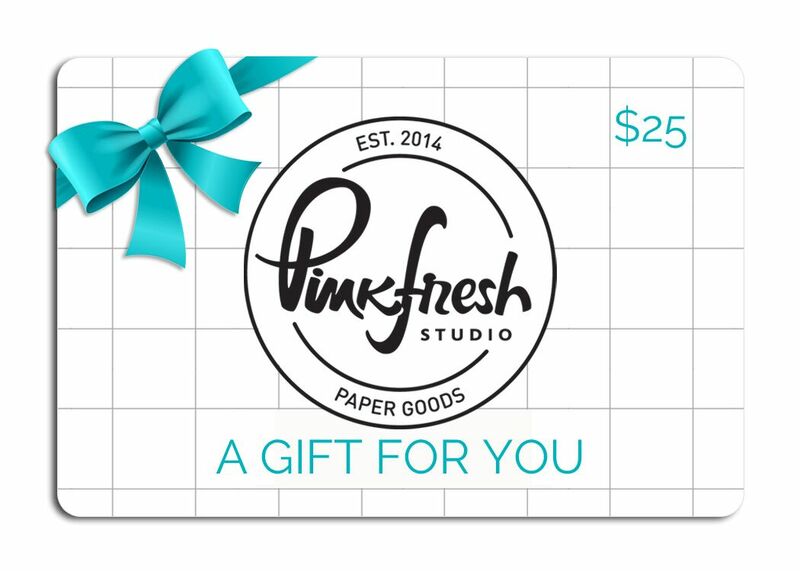 Each participant in the blog hop has a $25 gift card to the Pinkfresh Studio shop to give away, as well, so commenting along the way will help you score one of those. PLEASE NOTE: Winners will be picked and posted on Sunday, January 20th on the PF giveaway page on their blog. You must check that page and contact PF to claim your prize. You can find the page HERE. Also, they're offering 2 shopping promotions you may be interested in: The first is a free die with $25 purchase (Dainty Love Balloon). There is no code necessary for that, though you must spend $25. The second is free/discounted shipping from January 14th-17th on orders of $50. You must use the code JANFREESHIPWITH50. Shipping is free in the USA and $5.50 off for international friends. Ok, I'm done rambling! Thank you so much for being here today, now go say 'Hi!' to Yasmin! I love those scripted sentiments and your cards using them are gorgeous. TFS! 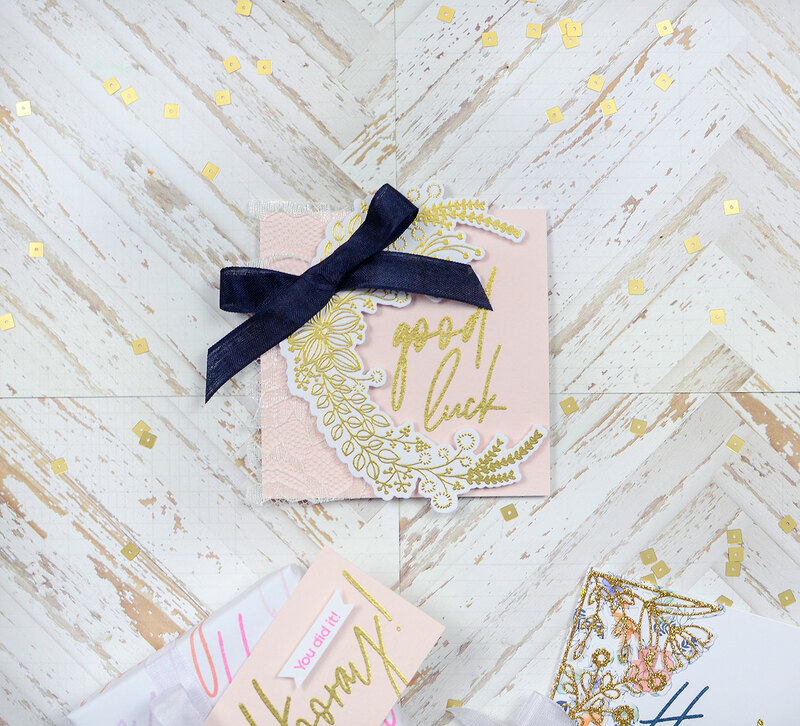 Love all the gold details and how you made the matching paper for your tag. Love how you decorated the gift! My favorite is the one with the gold flowers and the little petals spilling. What a lovely set! 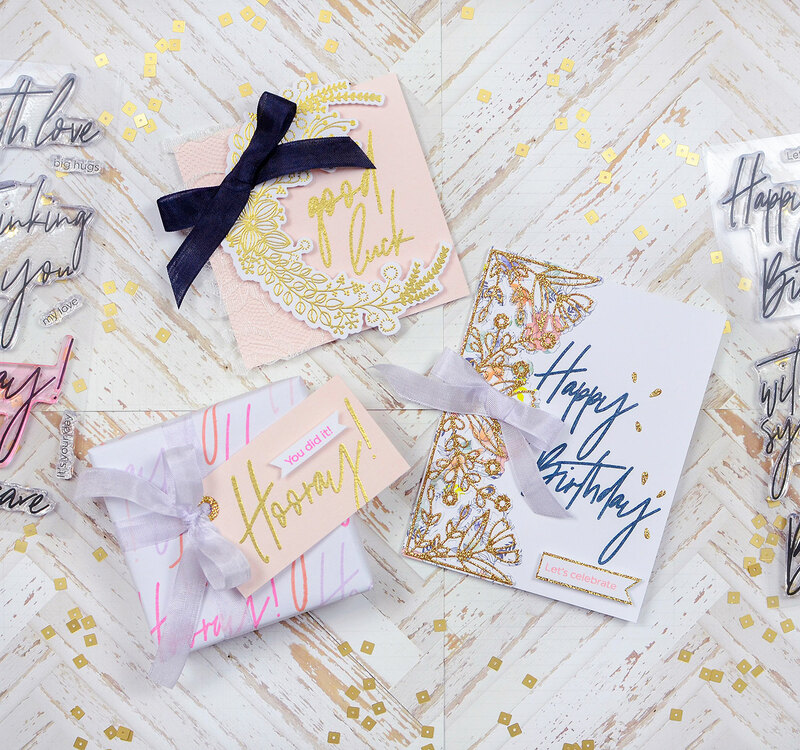 My favorites are the Scripted Bold Sentiments and that lovely Spring Floral die! That font set is really lovely! Thanks for all the inspiration! Absolutely love both the cards; especially the second card with embossed flowers stole my heart. Thanks for the great inspiration! Beautiful cards! I especially love the soft pink with gold combo. Love that gift wrap,and the cards are lovely as well. I just love all the gold and glitter you've integrated into your creations. They look so elegant. I love how you paired the fancy scrip sentiments and the die. So beautiful and unque! 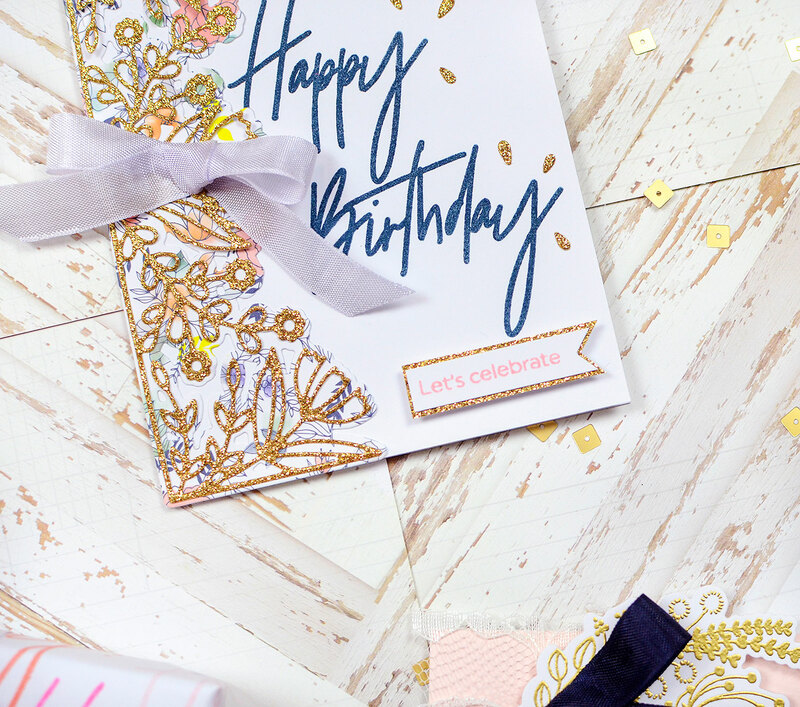 Love the homemade gift wrap and that fab-fabulous Happy Birthday card with the awesome sentiment, and touch of delicate gold sparkle! Wonderful cards! I love the bold script words, and you've showcased them beautifully! I love the gold accents on the Hooray tag you made, simple and elegant! Wow! Love the projects today. They are really inspiring. And I love the fabulous new release! I love the gold embossing and your ribbon accents! Such beautiful cards! Rebecca, thank you for sharing these beautiful cards! The sentiment stamp set is my absolutely my favorite item in the new release. I love your delicate use of them! Truly beautiful! Beautiful, elegant cards. The Scripted Bold Sentiments stamps are wonderful; I love the script. Beautiful projects! 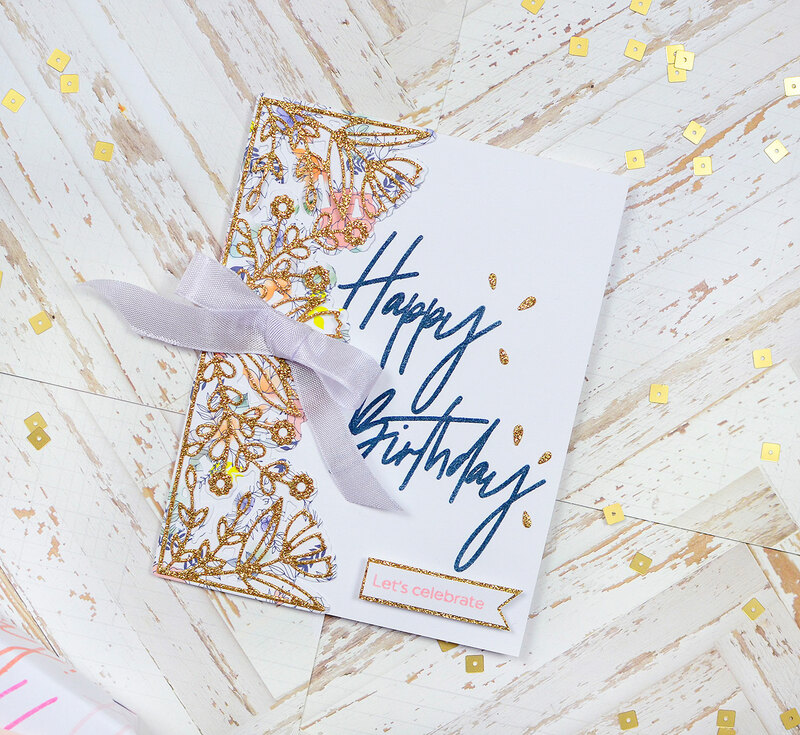 I love how you paired up the patterned paper with the new floral die! Looks amazing! And your stamped wrapping paper is super fun too!!! Very pretty and very creative! Love the gold embossing. And the handmade wrapping paper is fabulous. Love the big scripted words. I love a good scripty sentiment set - you rocked these Bold Sentiments! Love the ways you have used the stamps and dies, the glitter die cut on the first card looks awesome. Love the sentiment sets and floral designs! Wondering new stamps and dies! Beautiful cards! Wow! Gorgeous, elegant, feminine and fun. Stunning cards! Gorgeous cards, I especially love the gold with pink color combo. 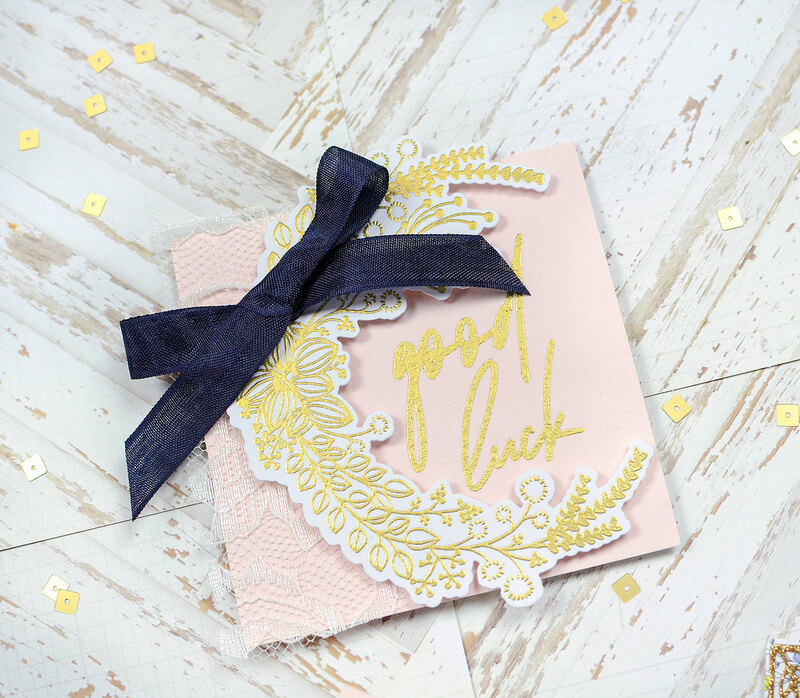 The scripted bold sentiments look fantastic and I love how you have used them in your cards! each one is really awesome and sends such a great message too! Super fun cards. Love all the gold. Wow I really love those bold sentiments. Your projects are fabulous! I'm looking at the fonts on these cards. It is just fantastic. I love it!! They look absolutely splendid with these new designs!! Great job!! Gorgeous cards!! The new release looks amazing! No kidding. It's a fantastic release. I love everything in it, but most of all those scripted sentiments. What a font! Love how you showcased them. Just gorgeous! Love this release and how you used it! Love the gift wrap! So pretty! I love the cards and the gift wrap! Wonderful cards and gift packaging ideas! Love all of the beautiful sentiments.... lovely in every color and in combination with the sparkle-y gold accents! I love the sentiments and especially the font they use!! The cards are lovely!! The colors are nice and soft. I like those sentiment fonts too. Thanks for sharing the different ways you used the on your gorgeous creations! 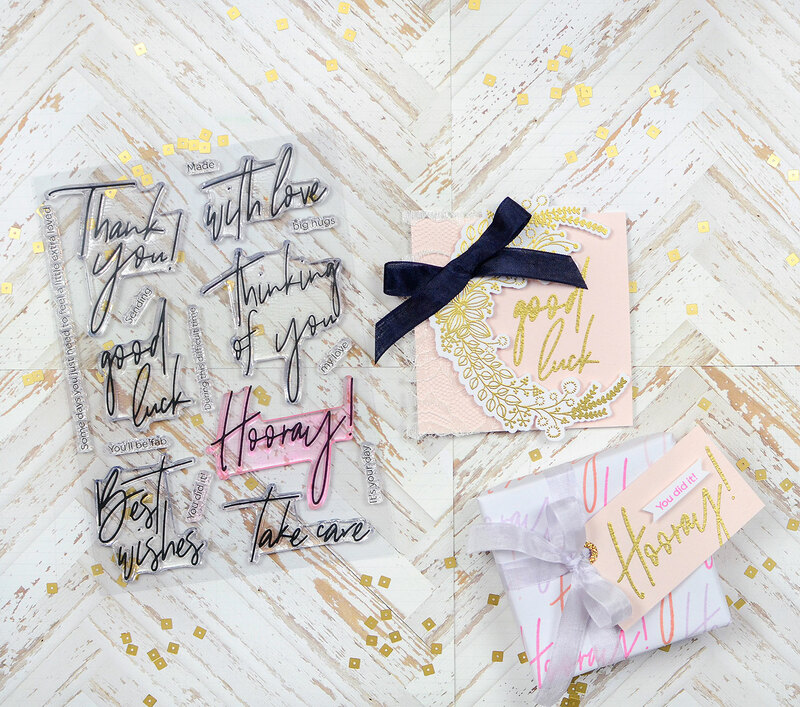 Gorgeous cards and I definitely need these scripted sentiments now! Beautiful job. Your cards and box are beautiful! These sentiment stamps are my favorite thing from the release and I love how you used them on your modern, graphic cards!! I love how you created your own wrapping paper and a tag to match. That font is perfect for it, and it looks amazing! Lovely card designs. The gold accents are lovely additions! These are all wonderful, I am in love with that scripty font! Love all the gold and the wrapped gift, great clean yet fancy so special I love it all. Gold and glitter are my favs and make all cards look so much better!! Such beautiful projects! 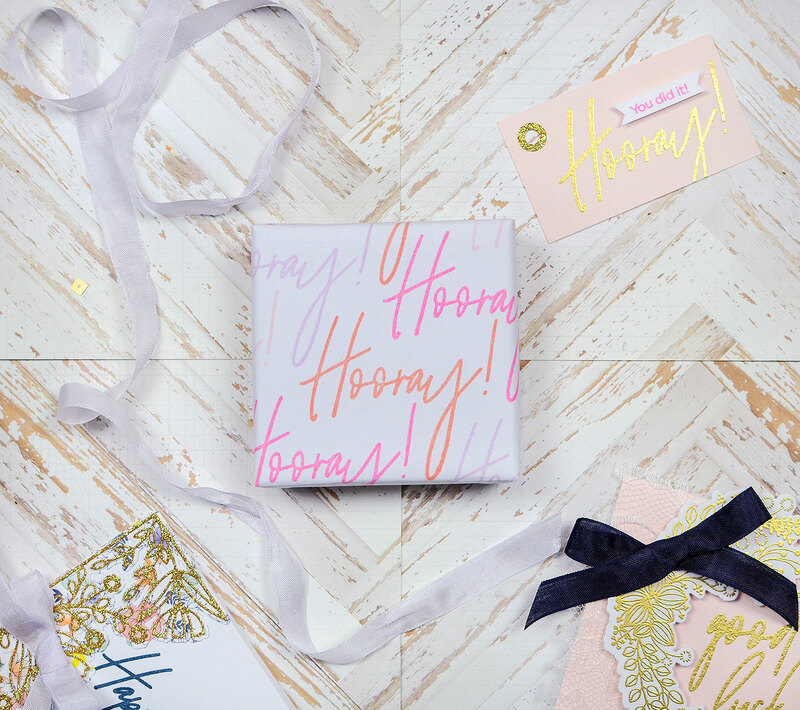 I love the simplicity and the impact of that hooray paper you used to wrap the gift. Those new sentiment sets are wonderful! I love your cards, there looks so elegants! Your cards are very pretty and I like how that sentiment looks on the box. Great job! Very pretty card designs. I like the gold embossing. These cards look so elegant. 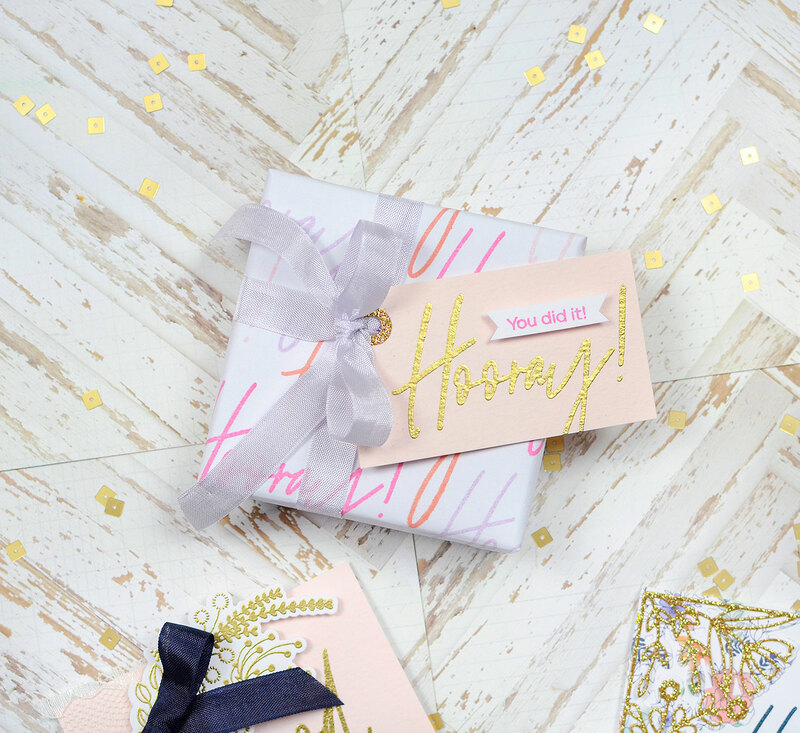 What a great idea to use the script fonts in making your own wrapping paper! Absolutely gorgeous cards! I love the font on those Script stamps & you have showcased them beautifully! Your cards look so bold and elegant ! All gold elements are eye-catching ! Beautiful cards, but I really love your wrapping paper! Love the colors you chose and thrn how you made a tag for it with the same sentiment. Awesome! Such a sweet set of cards that show how versatile these new products are. Thanks for sharing your creativity. Love the new script for the sentiments! Fabulous work!